Enter the enchanting The Magical Forest Slots to experience dreamlike wins! This fairy tale themed online slot game is magical and mystical and filled with Bonus symbols, multiplied wins, rewarding prizes and more! 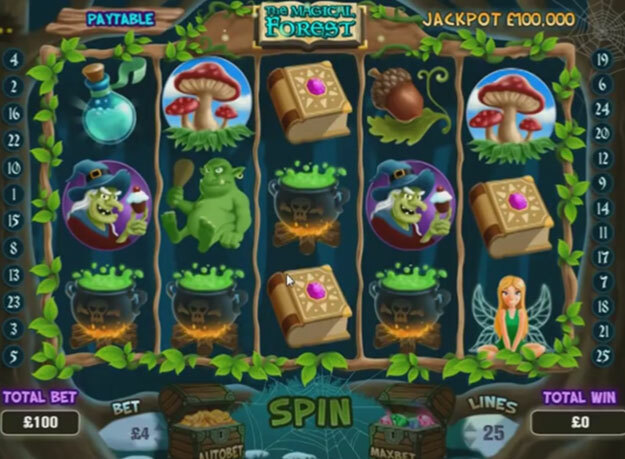 Play the fairylike 3D online slot game –The Magical Forest Slots! youll feel like you’ve entered a dreamlike state when you spin the reels filled with gorgeous graphics and magical sound effects. You’ll find bubbling cauldrons, witches, mushrooms, fairies, spellbooks, and magic potions across 5 reels and 25 paylines! If you can land at least 3 Centaur Scatters you’ll get multiplied wins as the Centaur floats across the reels playing his flute! 3 or more Spider Bonus symbols will activate the Bonus feature offering guaranteed wins! Good Luck!